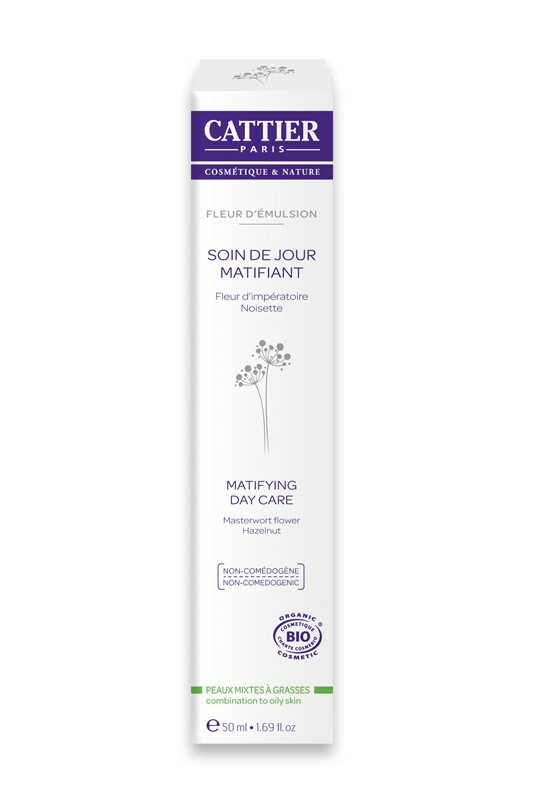 Non comedogenic Cattier's Organic Day Skincare "Fleur d’Émulsion" moisturizes and mattifies combination and oily skins. Formulated with hydrating Organic Aloe Vera and antioxidant Organic Hazelnut Oil, Cattier Organic Mattifying Skincare balances sebum production, purifies and protects the skin. It combines the toning and repairing properties of the Masterwort Flower with the seboregulating and purifying Phycosaccharide® (brown sea weed extract). Your skin is soft and clean, the shine is under control with Cattier Organic Mattifying Skincare Fleur d'émulsion ! Bonne crème matifiante, qui matifie assez bien pour ma part moi qui vis aux Antilles, texture légère, pénètre bien la peau, il en suffit de peu donc le pot dure longtemps. Seul petit bémol, le flacon pompe délivre parfois un peu trop de produit, sinon niquel, je rachèterais. 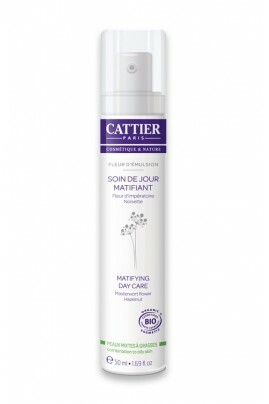 A GREAT ORGANIC MATTIFYING SKIN CARE BY CATTIER ! Press slowly the pump to deliver the optimum dose of Cattier Organic Mattifying Skincare Fleur d'émulsion, then apply all over the face, neck and décolleté until completely absorbed. Apply daily to a clean and dry skin for an even complexion, a soft, supple and perfectly moisturised skin. Organic aloe vera, Organic hazelnut oil, Organic sheabutter, Silica powder, Organic masterwort flower extract, Phycosaccharide® (brown sea weed extract). Je trouve que cette crème matifie plutôt bien. L'odeur est agréable, mais en revanche, la pompe donne parfois trop de produit. On utilise peu de produit, donc produit économique. Texture légère. Cependant, ne matifie pas assez ma peau grasse. Produit agréable qui hydrate bien mais ne matifie pas suffisamment ma peau. Odeur fantastique, très bon produit.